Shakespeare’s 450th birthday anniversary in April started me wondering to what extent The Bard used colour in his plays. Dredging my memory of school Shakespeare, Malvolio’s startling yellow and black legwear aside, the only colour references I remember are those glinting in ‘Anthony and Cleopatra’. The description of Cleopatra’s arrival by river is a master class in painting with words. Awash with colours that trumpet wealth and status, we are left in no doubt that Cleopatra is a figure of considerable power and influence. ‘The barge she sat in, like a burnish’d throne, Burn’d on the water: the poop was beaten gold; Purple the sails, and so perfumed that The winds were love-sick with them; the oars were silver, Which to the tune of flutes kept stroke, and made The water which they beat to follow faster, As amorous of their strokes. My guess is that this is the most densely coloured piece of Shakespeare; a poop of beaten gold, silver oars, a cloth of gold for a canopy, and pretty dimpled boys with multi-coloured fans. Quite something. And wafting atop all this ostentatious show of wealth are purple perfumed sails! Why purple? Why not red or yellow or green sails? Because they need to show status and they need to suggest perfume. No other colour is quite up to such a task. The world has always come on bended knee to purple. Purple is the colour of emperors, of royals, of lords and ladies; it is the ruling colour of the ruling classes. Purple is not a colour that occurs often in nature, and proved difficult to reproduce, until the Minoans (c. 3000 – 1450 BCE) of Ancient Crete discovered that a purple dye could be obtained from shellfish. One such mollusc was the ‘Purpura’, from which the term purple derives. Extracting the dye was a complex, labour intensive process and purple became a colour that only the rich and powerful could afford. The Ancient Romans used the colour in clothing to denote rank, the highest being the entirely purple toga reserved for emperors. Byzantine Emperors wrote in purple ink and sat on purple thrones; Byzantine Empresses gave birth in purple rooms, resulting in the term ‘born in the purple’, denoting birth to a family of high rank. And so it was in 16C London. By law only certain levels of society were allowed to wear purple. Sumptuary Laws had been used for centuries to restrict the consumption of luxury items and the Tudor Laws were especially thorough when it came to the colours and types of fabrics permitted to narrow and very particular strata of the financial and social classes. The Sumptuary Law of 1574 stated, ‘None shall wear in his apparel any silk of the colour of purple, cloth of gold tissue, nor fur of sables, but only the King, Queen, King’s mother, children, brethren, and sisters, uncles and aunts; and except dukes, marquises, and earls, who may wear the same in doublets, jerkins, linings of cloaks, gowns, and hose; and those of the Garter, purple in mantles only.’ So not for you commoners, OK? 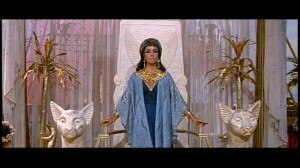 Shakespeare uses the high rank of purple to parade Cleopatra’s dynastic heritage. Such verbal painting can be found in a number of his works. In ‘Romeo and Juliet’, Prince Escalus, in an attempt to stop the warring between the Montague and Capulet families, talks of ‘ … purple fountains issuing from your veins’ (I,i, 105), a reference to the spilling of blood. The fact that these fountains of blood are purple rather than red is, in part, to indicate the wealth and status of the characters involved. Purple and blood are often linked in Shakespeare’s works. There are 23 uses of purple and in 11 of them blood is in close proximity. This has led some theorists to suggest that Shakespeare’s view of purple was rather more red than we would experience today. However I do not agree. Shakespeare used a lot of reds, including crimson and ruby – 103 in all, many in conjunction with roses, noses, lips, cheeks, fire and, of course, blood – all the things we associate with red. Shakespeare knew his red. No, when Shakespeare combines purple with blood he is conveying something different than when he uses red. Yes, there is the nobility angle, but there is also a quality to purple that is slightly over the top. In ‘Romeo and Juliet’ the fighting is getting out of hand, too many people are being killed – the spilt blood has turned from red to purple. Great Post! That’s why I love Jenny Joseph’s poem, ‘When I am an old woman I will wear purple’. She’s claiming this imperial powerful colour for older women, a group often ignored and marginalized. Absolutely! For some reason, my mother would have never been seen dead in purple. She didn’t even like me wearing it. I never found out why, but I think it was definitely her generation, which is why the Joseph poem was such a statement, such a call to arms. Joseph was born 2 years after my mother and therefore lived through the war and rationing, and ‘Warning‘ was published in 1961, well before the hippie heyday. I think the timing was a vital part of its popularity, often topping polls. It spoke to women of rebellion, of breaking out of the 1950s straitjacket. And still does. I think my mother saw the colour as too much, which is, after all, totally Purple!